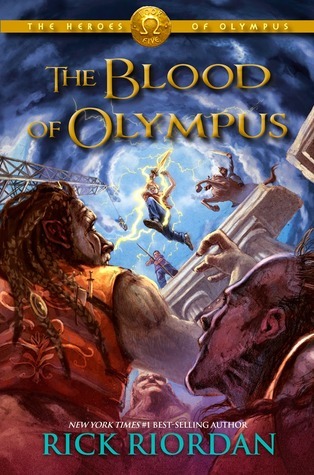 The Blood of Olympus is the final book in Rick Riordan's The Heroes of Olympus series. Though the Greek and Roman crew members of the Argo II have made progress in their many quests, they still no closer to defeating the earth mother, Gaea. Her giants have risen- all of them- and they're stronger than ever. They must be stopped before the Feast of Spes, when Gaea plans to have two demigods sacrificed in Athens. She needs their blood- the blood of Olympus- in order to wake. The demigods are having more frequent visions of a terrible battle at Camp Half-Blood. The Roman legion from Camp Jupiter, led by Octavian, is almost within striking distance. Though it is tempting to take the Athena Parthenos to Athens to use as a secret weapon, the friends know that the huge statue belongs back on Long Island, where it " might" be able to stop a war between the two camps. 1. I love this series, and its predecessor, Percy Jackson and the Olympians. Riordan keeps the book full of action and adventure. It is a hard book to put down because I was dying to see how it all would end. 2. I like that Riordan split the book between following the crew of Argo II, and the ones taking he Athena Parthenos back to Camp Half Blood. It add twice the amount of adventure and suspense of who and how they would succeed. 3. I really enjoyed both Reyna and Nico's chapters the most. I loved getting to know their personalities. I really came to like Reyna, which was a surprise for me. I was not a big fan of her in the earlier books, but as I got to know her better, I found I really enjoyed her chapters. Plus the scene that made me laugh the most was at the end when Nico tells Percy that he used to have a crush on him, but was over it because Percy was not really his type. The way Nico told it, and Percy's reaction was absolutely fantastic. 4. I have to admit that the character I really hated the most was not Gaea or any of the giants, but rather it was Octavian. Gaea and the giants made no pretense about their goals, but Octavian on the other hand was really using the Roman legion to raise himself to be a hero. He lied about his visions to them to gain power, and was an overall jerk about many things. 5. I very much enjoyed the way that Riordan ended the series. It all worked so well. And I think I owe Riordan a bit of thanks because of these books when I play trivia I am a master of Greek mythology questions.